UPDATED: Fri., July 7, 2017, 3:45 p.m.
HAMBURG, Germany – At long last face to face, President Donald Trump confronted Russian President Vladimir Putin directly Friday over Moscow’s meddling in the 2016 presidential campaign, as the two leaders sought to use their historic first meeting to move past the issue and forge closer cooperation on Syria. In a two-hours-plus meeting in Germany, Trump and Putin had a “robust and lengthy” discussion about the interference, though Putin denied involvement, said Secretary of State Rex Tillerson. His Russian counterpart, Foreign Minister Sergey Lavrov, said Trump had accepted Putin’s assurances that Russia didn’t meddle in the U.S. election – a divergent description of the conversation that illustrated each country’s effort to show its leader had held his ground. “I think the president is rightly focused on how do we move forward from something that may be an intractable disagreement at this point,” said Tillerson, who took part in the meeting along with Lavrov. 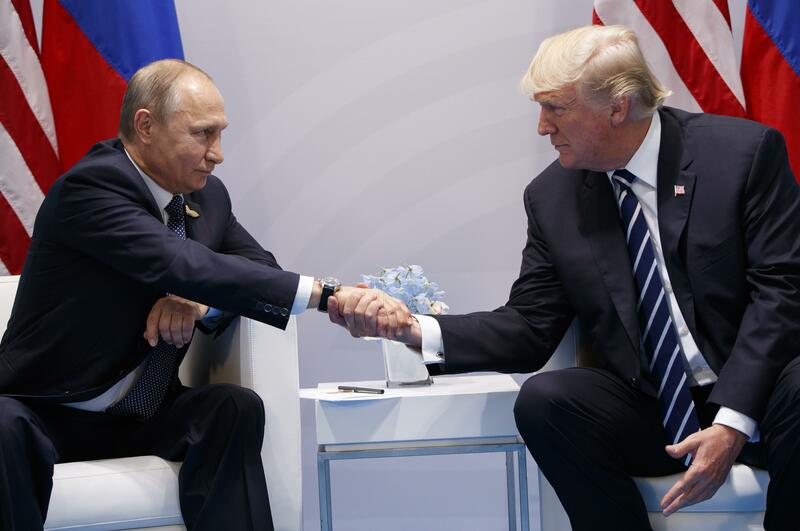 Trump’s decision to raise the issue directly with Putin fulfilled ardent demands by U.S. lawmakers of both parties that the president not shy away from the issue in his highly anticipated meeting with Putin. Trump has avoided stating unequivocally in the past that Russia interfered, even as investigations proceed into whether Trump’s campaign colluded with Russians who sought to help him win. On one point, Putin and Trump agreed, Tillerson said: The issue has become a hindrance to better relations between the two powers. The two leaders agreed to continue the discussion, with an eye toward securing a commitment that Russia won’t interfere in U.S. affairs in the future, Tillerson added. Still looking back, though, the Russians asked for “proof and evidence” of Moscow’s involvement in the 2016 election. Just a day earlier, Trump had said Russia probably meddled in the election, but that other countries probably did, too. With the world watching closely for signs of their emerging rapport, Trump and Putin shook hands firmly but briefly as reporters were allowed in for part of their meeting. Seated in front of a Russian flag, Putin slightly hunched in his chair and rubbed his fingers together as he listened to Trump, who appeared informal and relaxed and said it was “an honor” to be with Putin. “We look forward to a lot of very positive things happening for Russia, for the United States and for everybody concerned,” Trump said. The meeting, originally scheduled for 35 minutes, clocked in at 2 hours and 16 minutes. In their meeting, the two also discussed a ceasefire deal for southwestern Syria that was reached by Russia and the United States and first reported Friday by The Associated Press. Though the U.S. and Russia have held conflicting views on Syria in the past, Tillerson said Russia had an interest in seeing the Mideast nation become a stable place. Though Tillerson said details about the ceasefire need to be worked out, Lavrov said that Russian military police will monitor the ceasefire, with a monitoring center set up in Jordan – another party to the deal. Both the Russians and the Americans took pains to describe the meeting as “constructive,” cordial and wide-ranging, covering key topics including cyber security and North Korea. Still, Tillerson said no next meeting for Putin and Trump had been scheduled. The former Exxon Mobil CEO has done business in Russia and is one of the few senior members of Trump’s administration with experience dealing with Putin. The meeting has been closely scrutinized for signs of how friendly a rapport Trump and Putin will have. Trump’s predecessor, President Barack Obama, had notoriously strained ties to Putin, and Trump has expressed an interest in a better U.S.-Russia relationship. But deep skepticism about Russia in the U.S. and ongoing investigations into whether Trump’s campaign coordinated with Moscow during last year’s election have made a U.S.-Russia detente politically risky for Trump. The Putin meeting came midway through a hectic, four-day European visit for Trump, who addressed thousands of Poles in an outdoor speech in Warsaw, Poland, on Thursday. He met in Germany with Chancellor Angela Merkel, the summit host, and had dinner with two Asian allies – Japanese Prime Minister Shinzo Abe and South Korean President Moon Jae-in – to discuss North Korea’s aggression. Published: July 7, 2017, 7:38 a.m. Updated: July 7, 2017, 3:45 p.m.